one of my new challenges to myself is to get the perhapablog schedule in order, trying to get things back to the three times a week posting that we all remember fondly from days gone by. one of the problems, i think, is that i sometimes over think it, that somewhere along the way i convinced myself that any new post needed to cover several different topics, include a series of photos, and somehow contain , buried away in some obscure phrase or paragraph, the secret of life. an entry can be a sentence long. a word. a picture or a cartoon. so i need to simplify my expectations for each new perhapa-post and i hope that you will be patient with me as i try to get this thing going again. there are days, i know too, that i've felt i have nothing to offer here, nothing of any interest that i could or would share with everybody. with that in mind, i am asking, along with that patience, for your input. i get great links and jpgs from many of you already and i thank you for it, but i am very open to any of YOU that want to share something cool or creepy or funny with us, to send it in. or if you'd like to write a guest blog of your own--the door is WIIIIIIIDE open~! but another challenge i have before me includes you in a big way--it;'s already october 17th and i have been so asleep at the switch...! HALLOWEEN is 2 weeks away, gang!! where did the time go?!?! we gotta get on this!! just this morning, matt was telling me that it was creeping up on him and he just wasn't getting that halloween vibe. he's watched some horror movies, read some horror stories...and it's just not happening yet. so for his sake--and ours--let's get this party started huh? i need scary photos, scary stories, you modeling your halloween costumes--whatcha gonna be?--and ANYTHING that might get matt in the spirit! tell me the story of the scariest thing you ever saw/heard/read, the scariest thing that ever happened to you, the scariest movie (in your opinion) EVER MADE!! c'mon! let's DO this thing! to start things out a little here, here's a photo that our pal, ernie cooper took of his and megan's new cat...ummm, what did you name here, ernie? anyway, could be a trick of the flash...or was it?! "It was actually rather eerie. We tried to pick up a free cat but the owner called Megan and said he couldn't part with the little furball. A few days later this other little gal shows up on our doorstep at 3 AM, mewling sadly. She had me take that pic while we were getting accustomed to the house, and she asked, "Did you get it? Is she cute?" And I was all, "Um, sure....Cute in a terrifying kind of way." Whoa! That cat looks oddly like Yanosh (from Ghostbusters 2)in the scene where he is shining his eyes at Dana's aparment building after being possessed by Vigo!!!! What?! I know I'm a nerd, but go back and watch it! 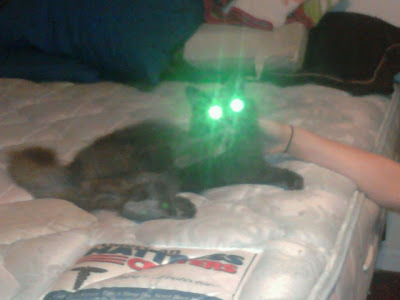 I think this cat is possessed by VIGO! And don't worry too much about the blog schedule. We check it faithfully no matter how much you post. It's a great blog! "I am Vigo, the Scourge of Carpathia! The Sorrow of Moldavia! Meow and stuff!" We dubbed her Arya...aka Arya Underfoot...a character from GAME OF THRONES. And I totally agree with Eric on his blog sentiments, not just in his fine taste in cinema!